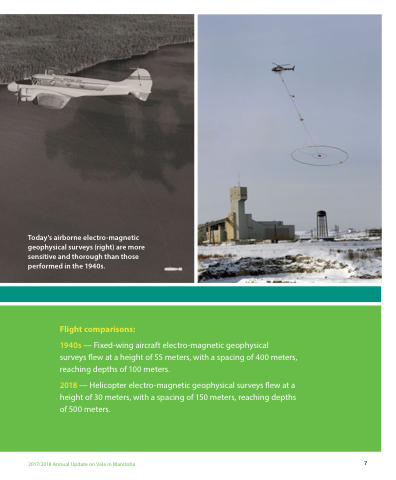 1940s — Fixed-wing aircraft electro-magnetic geophysical surveys flew at a height of 55 meters, with a spacing of 400 meters, reaching depths of 100 meters. 2018 — Helicopter electro-magnetic geophysical surveys flew at a height of 30 meters, with a spacing of 150 meters, reaching depths of 500 meters. Today’s airborne electro-magnetic geophysical surveys (right) are more sensitive and thorough than those performed in the 1940s.